This section covers the seven "3/4"-length domes designed by Frank H Stengle Jr and built by SP in their own shops during 1954 and 1955 for service on the San Joaquin Daylight, Shasta Daylight, and overland route service between Ogden and Oakland (the upper dome portions were built by Budd, technically making them "Budd" cars). In later years, the domes also worked the Coast Daylight. SP also owned other "full" and "regular" domes. See the link at the end of this section. At one end of the cars, on the main level, was a small cocktail lounge. Since the dome extended over it, and the lounge's windows were 5 ft. wide, this was an impressive space with an 11 ft high partial glass ceiling. Stairs went from the lounge to the dome - SP called them "Stairway to the Stars". 3600 and 3604-06 emerged in "Daylight" colors, while 3601-3603 started in "Overland" service and were painted UP armour yellow, gray, and red, then later into silver and red. 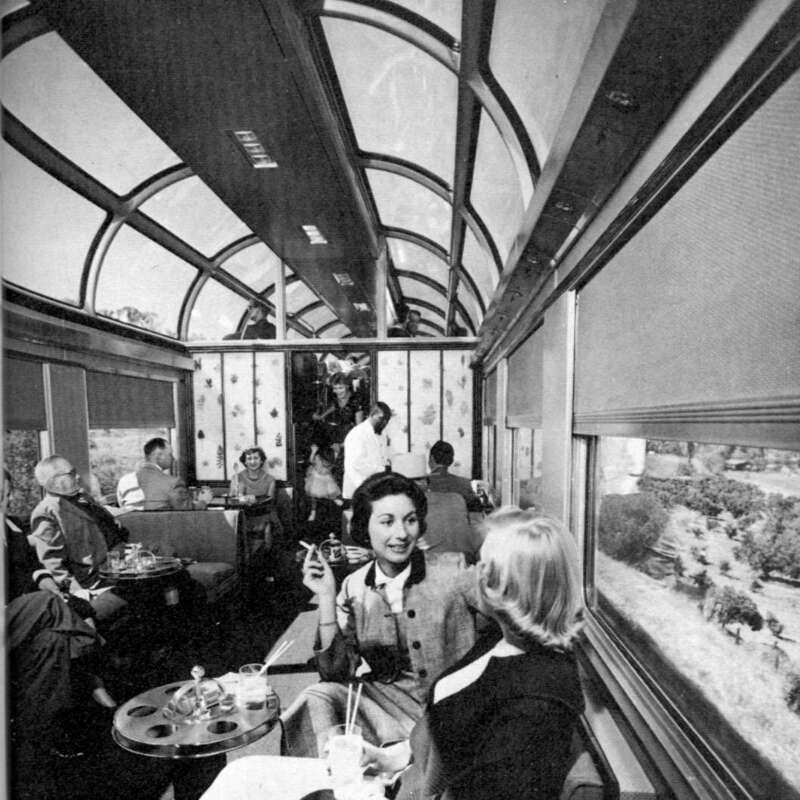 SP3600 - This was the only car released in 1954 (July), was built on the frame of an older parlor-round end observation #2950 (1937), and was 81 ft. long. All the others were 85 ft. It was also the only car with a true "3/4" dome - the others had a full-length dome with a 3/4 length upper floor beneath the glass. In 3600, the 1/4 remaining space was sleeper space for OB crew. The car was assigned to the San Joaquin Dayight, and was one of two cars not sold to Amtrak. Retired during 1970 by the SP, it was stored at the Bayshore Yards S San Francisco CA until sold, along with the 3606 and many other ex SP cars, to Purdy Metals Co of Chicago IL. The cars were being shipped out in batches to their Ewing CA facility for scrapping, but the 3600 was one of the later cars scheduled to be moved out and was looked at by the Charles Krug Wineries of Napa CA during 1972 for use as a wine tasting room. The car was moved to "storage" at the Oakland CA yards pending completion of the sale. Following a number of breakdowns in price negotiations to move and repair the car between Purdy and the SP, Krug cancelled the idea and during late 1972 this car was moved (along with the 3606), to their scrapping facility in Ewing CA. These two domes were spared as an investments group planned on using the cars as part of a restaurant to be located at the location of the former Benicia station at the junction of CA Hwy's 37 & 29 at Vallejo CA. This facility was to be named the "Rodeo Depot Steakhouse". The 3600 was the first to be moved there during 1972 still in the stainless steel/flat panel sided/red stripe scheme, but the plans fell through before the 3606 was moved. Purdy Metals re-possessed their "asset" during 1973 and moved the 3600 back to Ewing, where it joined the 3606 briefly before it was scrapped at the end of 1973. SP3601 - The car was built from ex-TNO parlor #700 (P.S. 1937) and released 3/55 for service on the San Francisco Overland (painted UPRR yellow colors with fluting). The car was "slab sided" by SP during 1970 and was pure silver/red stripe scheme by then. The car was leased by Amtrak as SP 9370 and was purchased and became Amtrak 9370 during 1972. The car was wrecked 3/77 on the "Coast Starlight" at Corning CA and was shipped to the ATSF Topeka KS shops and stored. The car was retired and sold during 1978 to George Champney/Champney & Co Scrapping. The car was sold (along with ex-Amt# 3500) to a farmer in Carbondale KS. The truckless cars became a Bait Shop and the dome was used as an office until it was declared unsafe following a bad storm that leaned the car too far over and started to collapse the car in on itself. The owner scrapped the car on his property during 1988-89, retaining the ex-SP lounge car. SP3602 - This car was built on lunch counter - tavern - lounge #10311 (P.S. 1937) with 34 dome seats. Outshopped 4/55 for use in San Francisco Overland service, it was first leased by Amtrak for a year as SP 9371 and sold as Amtrak 9371 during 1972. The car was stored in L.A.'s "Old Mexico" yards until sold 11/82 to D Redmound Bozeman MT. The car was moved to Montana for planned excursion service, but remained stored until sold 11/94 to the Golden Gate Railway Museum through their "Project 2472 Inc.". The car was moved by the BN as far as Portland OR where it was refused for interchange by the SP (figures). The car was moved to Doyle McCormick's facility in the former SP roundhouse along with the Pacific NorthWest Chapter's cars, where it remained until moved by the (now) UPRR during 1997. The car was in storage at the museum's former Hunters Point Naval Shipyard facility San Francisco CA awaiting rebuilding. In 9/05, GGRM was forced to vacate Hunters Point and the car was listed for sale. Purchased by Jon Clark 12/05 and moved to Commerce CA for eventual restoration. SP3603 - This car was built on lunch counter - tavern - lounge #10310 (P.S. 1937) with 34 dome seats. Outshopped 4/55 for use in San Francisco Overland service, it was first leased by Amtrak for a year as SP 9372 and sold as Amtrak 9372 during 1972. The car was retired during 1981 and sold 8/81 to Henry Frazier/Railway Services Co Rushton LA. The car was moved to Louisiana and stored until sold during late 1981 to Tony Belmont St Petersburg FL (former lead singer of rock group "Dion & the Belmonts"). The car was moved to St Pete becoming the "Belmont Station" Ice Cream Parlor. The car was INCORRECTLY lettered as "Southern Pacific # 3601" as well as "The Largest Railcar In The World" on it's gold painted window bands, but the Amtrak blue rectangle containing the Amtrak number 9372 was never removed. The parlor ceased operations after 1988 and the car remained there until the property (and car) were sold during 1989 to Roger Broderick Tampa FL who developed the location into a strip mall. The car was then "GIVEN" to John Greco Tampa FL and was trucked up to his "Econo Lodge/Steak Depot" on Busch Blvd in Tampa. The car was moved out in the parking lot near a former Amtrak/NP nee Katy coach near the pool. The car remained there and was weathering and vandalized until it was sold 5/98 to Jon Clark Cerritos CA. The car was later sold to Dr. Arthur Cushman Madison TN (Nashville) and was placed on a TTX flat car and moved up to the former Southeastern Specialties (now Railsouth/Quantum Rail) facility outside Jacksonville FL. The car was stored there awaiting a decision from Dr. Cushman if it was economically feasible to rebuild the car, and was reported (11/99) to be headed to Illinois Transit Assembly. Reported by ITA that car was sold 7/2000 to Pete Messina for rebuilding and use on Panama Railway. Car reportedly bound for New Orleans 9/2000. Reported still in FL 1/2001 getting underframe work done to make it transportable. Will end up in "Southern Belle" black & yellow paint. 5/6/2001 car arrived in New Orleans and rebuilding in progress - all new steel replacement (see photos) - 3 a/c units (27 tons) and has swapped its disk-brake trucks for outside-swing-hangar tread-brake trucks from an ex-Amtrak baggage-dormitory car (ex U.S. Army hospital car) - cherry woodwork and green upholstery. 9/2001 car completed as "Rio Chagres" and shipped to Panama for operation. SP3604 - The car was built from #3000, a 29 seat parlor - one drawing room car built by P.S. in 1937, and was released 5/55 for San Joaquin Daylight service. The car was also "slab sided" by the SP during 1968/69. It was retired during 1970 and stored at Bayshore Yards SSF CA. The car was leased by Amtrak for the year of 1971 as SP 9373 and became Amtrak 9373 during 1972. The car was retired during 1981 and was stored at the "Old Mexico" yards in L.A. CA. The car sold 5/81 to (the late) J R Reed La Mirada CA/Standard Industries and was planned for use as an employee lunch room. The estate sold this car along with several other cars there to Jim Stephenson Bellaire TX. The car was sold again 6/87 to David Paradeau Bloomington MN. The car was rebuilt during 1987 and became the "Grand Dome" on the (then) "Minnetonka Zephyr Dinner Train" out of suburban Minneapolis MN. The train was later moved to Stillwater MN and was re-named the "Minnesota Zephyr Dinner Train". The car was still running in dinner train service. Tracks ripped out in 2007 and car is now a stationary restaurant in 2008. SP3605 - The car was fabricated from tavern #10312 (P.S. 1937), had a 48 seat upper dome lounge, and was outshopped 5/55 for "Shasta Daylight" service. The car was also slab sided by SP during 1969, and was stored during 1970 at Bayshore Yards SSF CA before being leased to Amtrak as SP 9374 during 1971 and becoming Amtrak 9374 during 1972. The car was retired during 1981 and was also stored at the "Old Mexico" yards in L.A. CA. The car was sold 5/81 to Mickey Stanley Colorado Springs CO/Stanley & Co and was moved to the former ATSF depot in Colorado Springs where it was used as his office. The car was sold during 1985 to Fred Kepner Kalamath Falls OR for use in his planned "Great Western RR Museum" and was to be moved to McCloud CA where the museum was to be established. While these plans were in motion the car was moved to storage in Denver CO and languished there as the museum plans fell through. Owing too much in storage charges, Fred's MOTHER, Lucile Kepner, listed the car as "for sale" during 1989. The car was finally purchased during 1991 by Bill Wallace Alpine CA. The car was cleaned up and placed into Mexican excursion service along with a series of interesting streamlined cars by his "Bananafish Tours" This service had the car in it's Amtrak/SP configuration and lasted until 1993. The car and trainset were sold to Bernave Reys Mexicali Baja California Norte' and remained in dead storage until once more repurchased during mid-1995 by the same Bill Wallace. The car was refurbished and rebuilt as a "Dome/sleeper/lounge". Althought not originally constructed as a "dome", the car wound up being only the second P-S car to ever see "Dome Sleeper" service. The car had it's stainless steel panels cleaned, it's window bands repainted a light shade of blue/gray, and was named "Laura" after the owner's wife. The car was based in Mexicali in "Copper Canyon" excursion service. Sold and moved thru Salt Lake City 12/2000 to the Canon City & Royal Gorge Railway, Canon City CO (car had been painted green as CRRX 9374). Due to the purchase of 3 ex Holland America domes in 9/05, this car was relegated to long term storage until needed (at least 5 years). SP3606 - The car was built from ex-T&NO# 950 (P-S 1937 diner lounge/round end observation). The car was outshopped 4/55 for "Shasta Daylight" service. This car was also "slab sided" by the SP during 1968 and was retired during 1970 as well (but came out of retirement briefly - see the "car identification" below). The car was rejected by Amtrak and like sister car SP 3600 was sold during 1971 to Purdy Metals of Chicago IL for scrap. These two domes were spared as an investment group planned on using the cars as part of a restaurant to be located at the ex Benicia station at the junction of CA Hwy's 37 & 29 at Vallejo CA. This facility was to be named the "Rodeo Depot Steakhouse". The 3600 was moved there during 1972, but the plans fell through before the 3606 was moved. The car sat deteriorating until 1976, when it was "discovered" by Evelyn Mills of Rocklin CA. Mrs Mills purchased the car outright during 1976 from Purdy, along with former Amtrak/nee-SP coach 7517. The 3606 and later 7517 were shipped up to the exact same spot at the now destroyed depot on the original site of the Rodeo Depot Restaurant. The car remained there for about a year and a half, having most of its dome glass smashed in by vandals and having windows get plywood covering as time went by. During late 1978 the car was trucked up to a RR themed mini-mall being developed by Mrs Mills named "Rocklin Transportation Center" in the town of Rocklin CA some 20 miles away. The 3606 was refurbished, along with the ex Amtrak 7517, three other heavyweights, and a number of boxcars and cabooses for stationary use as retail space. The 3606 was first made into (what else) a restaurant "table room". In 1986 the complex and cars were sold to another area developer named Ed Purvis, and the dome became an ice cream parlor (2nd ex-SP dome to be so used). Again the complex was sold, this time in1988, to Donald Krause, whom renamed the complex "The Rocklin Train Depot", remaining in retail space use. The dome next became a dress shop, then was rented to "The Ocean Shore Printing Company". They moved out during 1997, and the space was leased to the "Alta Sierra Transportation Company"(a towing service) as office space. The car remains in retail space use, landlocked in a string of former SP passenger cars (including a "daylight" painted open-end observation car used as a bar), a 3-door heavyweight baggage car also in "daylight" paint, and many SP "cabeese". SP purchased (and scrapped) "full" dome GN 1393, seized CBQ 4728 for unpaid storage charges and sold it to a scrap dealer, got title to CBQ 304, SP&S 306, and NP 309 from ANSCO/D&RGW and "inherited" ex WP 832 from D&RGW and later sold all cars to private individuals. Click the links above for detailed histories on those cars. "OK - I realize that this is a 'stump the chump' issue, but since the first time you asked me to ID this car back on April 12th 2000, I did a little more homework. Simply, the shot is at Sparks NV during March 1971, so this was during the final chapter of Espee's transcon SP / UP 'Overland' service. By the final few years Espee had dropped so many runs that the original assignments for the domes were scattered to the wind. This train in the picture is really the UPRR's 'City of San Francisco' as the 'Overland' was combined with the UP train during 1968. Now back in April I was under the impression that this was the SP 3603 as cars #3601 through 3603 were assigned to the 'Overland' (in fact you have that jpeg from the Dorn book of SP 3601 in full fluting and UPRR colors). However, Frailey's 'Trains in Twilight' (excellent book!) claims that equipment was a free for all at the end, and this is 'THE END' Baby! From March to the May 1st 'Amtrak Day' anything with semicircular wheels that would still roll would be sent out. Thus, no way to tell which car it is? NAW, it's the SP #3606! Simple... it was the ONLY car that had its' 'Daylight' logo re-applied after the 1959 loss of the 'Daylight' colors! Retaining this logo after the `59 silver & red repainting, AND again!!!!!! after the side fluting was yanked off during 1969! This was IT! The ONLY SP dome with the 'Daylight' logo left at this late date! I was under the impression back in April that the scratches in the photo matched similar ones on the 3603, but these gouges are on the port side of the car (lounge first), where as the 3603's scratches were smaller, and on the starboard side! Answer: SP dome #3606 on the Tri-weekly City of S.F. during March 1971, heading westward thru Sparks NV from Ogden UT where these cars were added and UPRR domes removed! Ahhhhhh, I LOVE this stuff! I have a friendly disagreement with Phil re his "car ID" paragraph on the 3/4 dome page, re car 3606. I have noticed that it appears as though the SP 3601 & 3606 may have been the only production 3/4 domes that were either built or re-sided with stainless steel pier panels. The other 4 cars seem to have painted steel pier panels. The photo in question of the unidentified car on the 3606 page appears to show a painted pier panel - note different appearance of pier panel vs girder sheet. Then, in the Vallejo pictures after retirement, the 3606 clearly has the unpainted stainless pier panels. Another point is that the 3606 in all the other photos has all of the propane racks closer to the middle of the car, and the mystery car clearly has them partially under the 4 lower-level side windows. With that in mind, I contend that the "mystery car" is in fact the SP 3602. See photo #10 of the 3602 series - "3602 as 9371 at Chicago 12/73 by Phil Sims". Note that the crease in the girder sheet and the undercar equipment, specifically the location of the propane racks, match perfectly. Just a little fun on a slow day.